Tetralysal is a medication for acne. It contains the antibiotic lymecycline, which fights bacteria improves the look of your skin. It needs to be taken for several weeks in order to take visible effect. Epiduo is a topical gel that help treat acne symptoms. To buy Tetralysal and Epiduo online, you need a prescription. You can get both a prescription and medication using our convenient online doctor service. Just fill in our brief assessment questionnaire and choose your preferred treatment. Our doctor will use your answers to check which treatment is suitable for you, just like your GP would. You will need to upload a photograph of the affected skin area, so our online doctor can assess your skin condition. How does Tetralysal heal acne? Tetralysal is a branded medication which contains the antibiotic lymecycline. 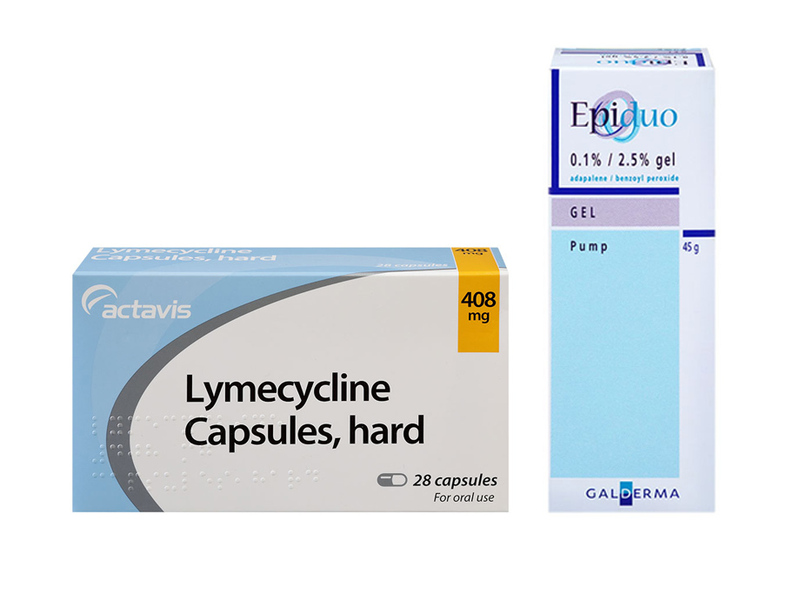 Lymecycline belongs to the group of tetracycline antibiotics. It can be prescribed for a range of bacterial infections but is most commonly used to treat acne vulgaris. Acne is caused by bacteria called propionibacterium acnes, which live on your skin. They live of excess sebum your skin produces and cause inflammation, whiteheads and spots. In some cases, they can also cause the development of large cysts. Lymecycline kills acne bacteria and allows your skin to recover from inflammation and bacterial infection. We only offer lymecycline with Epiduo because it’s recommended by NICE and the PCDS to only offer antibiotics with topical creams. Acne treatment with tetralysal involves a standard course of three months, during which you will be taking one tablet daily. Each tetralysal tablet contains 300mg of lymecycline, the active substance. You should follow the course as prescribed by your doctor unless you suffer from side effects. It takes time for acne to respond to antibiotic treatment, which is why lymecycline is taken for three months. You should notice a significant improvement within this time frame. How are Tetralysal and Epiduo taken? You should take your daily lymecycline tablet every morning with a glass of water. If you have forgotten one dose of Tetralysal, just take it as soon as you remember. If it is almost time for the next capsule, just take one. Do not take two capsules at the same time to make up for a missed dose. Epiduo gel contains 0.1% adapalene and 2.5% benzoyl peroxide. You use it once a day and apply a thin layer of gel to your acne symptoms. Who can take Tetralysal with Epiduo? When you order Tetralysal from Superdrug, our online doctor will make sure the antibiotic is suitable for you. It is important that you answer all questions on our assessment questionnaire correctly and carefully, as lymecycline and other tetracycline antibiotics are not suitable for everyone. You may not be able to use Epiduo if you’re pregnant, breastfeeding, or need to spend a lot of time in direct sunlight. The active ingredient in Tetralysal (lymecycline) can interact with certain other medications. Tell your prescribing doctor about any medications you are taking or have recently taken before beginning treatment with lymecycline. This includes over the counter medicines and natural remedies. Lymecycline interacts with hormonal contraception and can render it ineffective. You may need to use additional protection while taking the antibiotic and for a week after your treatment has ended. Epiduo can also react with some other medication. Make sure you mention all your current medications when ordering acne treatment. For a full list of possible side effects read the patient leaflet supplied with your lymecycline tablets. Epiduo can also cause side effects, including: redness, dryness, peeling, burning, stinging, scaling, swelling, itching, or your acne symptoms getting temporarily worse.